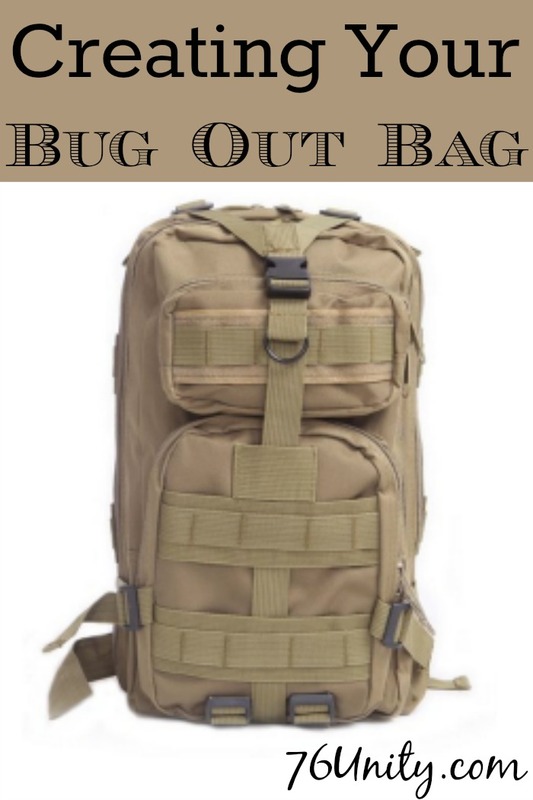 A Bug Out Bag (BOB) is a large pack filled with everything you would need to take with you to survive for a few days after a disaster, if you were forced (or chose) to leave your home. It needs to be small enough to carry easily, yet large enough to hold at least 72 hours worth of supplies. You should keep a fully-stocked BOB for each member of your house in an easily accessible location at all times. Setting up your BOB doesn’t have to be an expensive undertaking. Start by making a list of the things you would need. Once you’ve made the list, you can start collecting those items. You may have most of them laying around the house already! After you have all your items, sort them out into piles. At our house, everyone carries a bag but the children’s bags are much lighter than the adults. Originally the youngest children weren’t going to carry a bag but they’ve shown an interest & have practiced while hiking. Once you know how much needs to fit into each bag, you can start shopping for them. Water: You need at least 1 Liter of water per person per day. Water purification tabs are a great thing to pack too. We always keep a case of bottled water in our car for emergencies, plus you can grab collapsible water bottles. 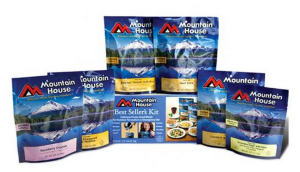 Food: MREs and energy bars are a good starting point. You want something that doesn’t take up a lot of space but provides lots of calories. If you end up having to bug out on foot, you’ll need to keep your energy up. Make sure these are things you can actually eat by trying them first (you don’t want picky eaters skipping meals because they can’t/won’t eat what you packed) and rotate your food so nothing expires. Remember store what you eat and eat what you store! Clothing: This isn’t about fashion or clean clothes, so don’t think you are packing 3 changes of clothes. You need to store hiking boots or sturdy shoes near your BOB so you can switch quickly when you grab your bag. In your bag, you need a change of clothes that’s weather appropriate. Plan to dress in layers and if you have 4 seasons, change out the clothes in your bag as needed so you are always ready. You’ll need extra socks, a jacket (waterproof and warm), thermal underwear, a hat, and a bandana. I’m very light sensitive so I have sunglasses stashed all over, so I can at least start out with a pair & help avoid a migraine. If you wear glasses or contacts, make sure you have extras packed in your bag. You don’t want to be blind when SHTF! Shelter: At minimum, you need a way to create a wind-blocking shelter and something to sleep on. One skill I highly recommend is the ability to create a shelter without any tools. We’ll be sharing some tutorials of the types of shelters we’ve practiced building soon. Until you have the skills, you’re going to need to rely on materials you can purchase. A good sleeping bag will always come in handy. You can bring a tent or you can make a shelter with a couple tarps. We also have emergency blankets in each BOB since they take up so little space. An entertaining video on building a natural shelter without any tools, twine, or other supplies. First Aid: I’m not a fan of prepackaged first aid kits. They often have items you won’t need and are missing things you are going to need. Check out this great post from Doom & Bloom on First Aid for your BOB! Hygiene: Keeping it simple is a must. Toothbrush & travel size toothpaste/toothpowder, travel size foot powder, baby wipes (travel size, not the big tub), and feminine hygiene products for the ladies. I highly recommend a menstrual cup vs a box of pads/tampons, but we have a whole post in the works for feminine hygiene when SHTF. If you have the room for a full hygiene kit, MyLitter.com has a great post on them! Weapons: If SHTF you may find yourself in a WROL situation and need to be able to protect what you have. We highly recommend legally acquiring several types of weapons (pistols, rifles, shotguns, and knifes) and becoming familiar with them. Make them part of your EDC (Every Day Carry) once you are proficient with them (where legal) and make sure they are part of your bug out kit. Other Gear: Compass, fire starter, flashlight, crank radio, whistle, paracord, duct tape, multitool, etc. You can pack different things in each family members bag to take a variety, but I’d recommend a whistle in every bag & a fire starter in each adult’s bag. Personal Documents: Birth certificates for all family members, insurance policies, passports, medications list, addresses for other family, etc. Keep copies of everything in a waterproof bag inside your bug out bag. So, you have your BOBs all ready. Now you need to make sure everyone knows what to do in an emergency and you have your evacuation routes planned. Notice I said ROUTES. You will need more than one bug out location. Try to do one close to home (within 30 miles), one in another direction yet still close to home, and then a couple 30-100 miles out. Know how far you can get on half a tank of gas & try to always keep at least that in your car. In an emergency, you don’t want to be waiting in line at the gas pumps. Have anything in your BOB I forgot? Leave a comment below!